through slats of a fence. This entry was posted in Recent Posts and tagged Anticipation, Art, Blushing, Control, Flower, Longing, Photography, Poet, Poetry, Relationships, Roses, Shy, Submission, Waiting, Want, Watching. Bookmark the permalink. I love the front row seats you gave us all for this piece ~ the fragrance, mood and “her pink, shy blossoms, all on her own.” This is a scene that I think people would wish to see again and again (and again…) until finally, “the sigh of her submission, honors you.” Beautiful. Ha. Yes well now only so many front row seats available, Dalo, you got there just in time. Smiles. I was setting a scene, and seductively, I suppose. Whisper (again), one more time, please. Loved hearing that from you. Thank you for seeing this poem just as she was intended. Humbled. You’ve been gone a while. Feels good to read you again. Raced through reading this poem the first time, took my sweet time the second, who knows about the third but it’s likely to happen. Now I could get used to reading about how something I’ve written is worthy of reading more than once. Thank you! -and, yes, I agree. So much.- Indeed. I appreciate your being near, Michael. Made it home safely. Exhaling. Hi, Jay. Thanks so much! Those sighs of submission get ya every time. Yes, I have no doubt that they do, John. I’ve seen those charms at work. Beautiful Audrey. And that is an amazing photo. those flowers are so vibrantly pink and pretty. Thanks, Staci. 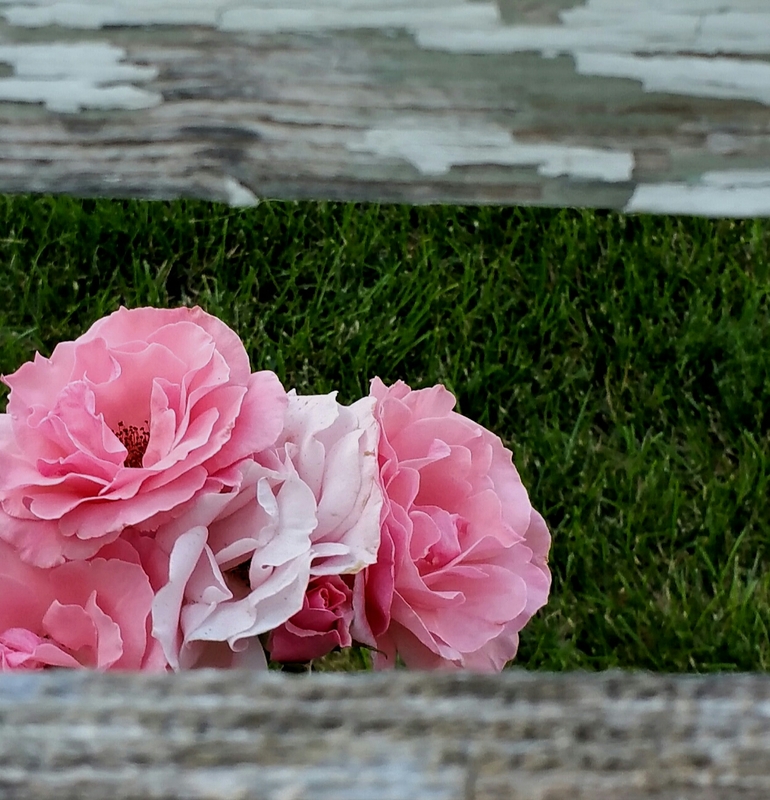 I saw these flowers through the fence and fell for them. Had an incredible desire to grab them and run. Giggle. Hahahahaha. The only thing that kept you from doing so was your conscience, right? Hahaha. Full? Oh boy! GPS? Seems suspicious, Cowboy. *licks finger and sticks it in the air* Oh, the windy part near the straight section of the woods and just past the red barn in Central Connecticut. *eyes darting around* How’d you see my blouse from Montana? Bags of letters, of course I’ll put you up in the barn. You have to read each one to me though. Laughs. Could take an eternity. Hope the others waiting for letters don’t mind you being late. It is a dangerous job. Could rethink accepting the badge. Twice?! *swoons* I love rereading true romance! Thank you, Izza. Glad you enjoyed this poem. You’ve once again captured a distinct mood quite elegantly, Audrey. I love it. Hi, Luke. Thank you for saying so and for stopping by. Glad you loved this poem. Hugs!